National Law University Odisha (NLUO) is an autonomous law university in India. The institute is located at Cuttack, Odisha. The University offers integrated B.A. LL.B. and B.B.A. LL.B. courses. The Institute offers undergraduate and post-graduate courses in various streams of law. Its first session began in 2009; classes started from 20 July 2009. The first batch consisted of 120 students, 60 each in B.B.A LL.B and B.A. LL.B. The University has shifted to its new campus at Naraj Barage in June, 2012. The new campus has an area of 50 acres sanctioned by the Odisha government. Odisha government has sanctioned Rs. 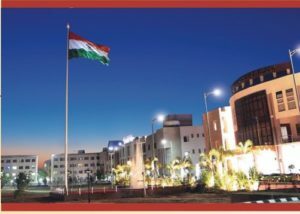 160 crore for its campus development. The formal inaugural function of the university was on 31 October 2009. The first Vice Chancellor of the NLUO was Faizan Mustafa. Recently Registrar of National Law University, Delhi Srikrishna Deva Rao became the Vice-Chancellor of this University. The total number of seats for both courses is 180, divided into 120 seats for B.A.LL.B and 60 for B.B.A LL.B. (Hons.) Study Program. Of the 120 BA LLB places, 14 are reserved for scheduled tribes, 10 for scheduled castes, 4 for the disabled, 4 for foreign nationals and 10 for NRI. The university does not provide state domicile reservation. The university has excelled in mooting and other competitions. It has been ranked 5 in the mooting premier league which is decided on the basis of cumulative points earned in multiple competitions. NLUO has qualified consecutively in 2016 and in 2017 for the international rounds of the prestigious Philip C. Jessup Moot Court Competition. While in 2016 it finished in top 16, in 2017, NLUO was the Semi Finalist in the world rounds. Also in 2017, NLUO was the winner in the National rounds of Jessup. You can visit the website of the University HERE to know more about the place.